Blogs can be therapeutic. They give you the opportunity to get stuff down on 'paper' in a format where you'll be able to find it again. They also let your readers know more about you than they may discover in a conversation face-to-face. It's a lot like writing a letter except that you can write it for whoever has an interest in knowing more about you an your thoughts. One of the things I really enjoyed about Ken Burn's Civil War documentary was the reading of letters of people long gone, what they thought and how they felt. My relationship with my wife (wife-to-be at the time) began as a series of letters back and forth.They would probably be fun to read right now, but I have no idea where they went. A blog puts stuff down in a place where you can find it again, and so can others. Can you mix alcohol with lightweight hiking? Okay, with that being said, I can finally get to the point - I have a problem with alcohol. I have for quite some time. I imagine that there are others like me, who have the same problem and keep it to themselves. Quietly doing what they do without really communicating to others what your problem is or why. I have put a lot of stuff together about my problem, but as far as I can remember, this is the first time I have made it public. I was prompted to post this by an article by Beth Boyst in the Spring 2014 edition of the Pacific Crest Trail Communicator published by the Pacific Crest Trail Association. Beth wrote an article called Thinking about the fire hazard where she writes about the fire danger of using an alcohol stove. She refers to "stoves without a closed reservoir to contain fuel and a positive shut-off valve" which pretty much describes my alcohol stoves. If you've spent any time reading gear lists of PCT thru-hikers or other ultra-light hiking enthusiasts you quickly see a pattern of super-lightweight and or do-it-yourself stoves. From the iconic cat-stove (made from a cat food can, hence the name) to more recent, high-tech stoves with integrated windscreens and better control systems. What all of these have in common is a burn-till-the-fuel's-gone type of shut-off system. Beth's article concludes with the hope that "changing from the use of these types of stoves will create some exceptional technological solutions and decrease wildfire risk." Her article got me thinking about my own subjective pseudo-scientific research that has led me to leave my alcohol stove at home and use a canister stove. I write not as an advocate either way. I know gear is a personal choice for each hiker and preferences die-hard. My only purpose is to share what I have found and my opinions on the matter. I, like Beth, am hopeful that we all can utilize technology to reduce wildfire risk. My problem with alcohol began with my first purchase of a Vargo Titanium Triad alcohol stove. I like the theory of alcohol stoves. I believe in the idea of reducing weight and anything that contains fire is typically made of metal. Titanium is lighter and stronger than aluminum, so a titanium stove seemed to be ideal. Then I found that a mini-red-bull-can stove, even though made of heavier aluminum is significantly lighter than the Triad because of the thinness of the material, so I got one of those. I also liked the idea of carrying fuel in a lightweight plastic container rather than a heavy-when-empty pressurized metal container. I like the idea that I could bring exactly the amount of fuel that I need rather than a partially full canister that may, or may not, have enough fuel. All-in-all the idea of an alcohol stove is a wonderful concept theoretically that I found very attractive. When it comes to reality, my experiences have not lived up to the theoretically good-times that I was supposed to experience with alcohol. In order to provide context you need to understand one of my primary tenets of light-weight hiking. I consider myself a comfort-light hiker. I have zero interest in setting the record on the lightest pack. I am not an advocate to go back to living in the stone-ages. My basic goal and rule is to minimize the distractions and effort that it takes to live so as to fully focus on the joy of being alive without the distractions and busy-ness of modern culture. I want to bring gear that reduces the complexity of living. For example, I choose to bring a shelter so that I don't have to deal with mosquitoes eating my face while I am sleeping and if it begins to rain, I don't have to get up in the middle of the night to change my situation. I could leave my tent home, but that would increase the 'stress' of life in the back-country, not reduce it. Every item in my gear-list is in, or not in, based on this fundamental rule. Burning alcohol is almost invisible. How do you know if your stove is burning? Put your hand over it. I personally don't like not knowing if my stove is still lit and having to check with my hand. It is also difficult to tell if the stove has been lit and more than once have lost most of the hair on my hand from trying to light a stove that was already lit. Once it's lit, it's going to burn until the fuel is consumed. The more I used my alcohol stove the better I got at gauging the amount of fuel I would need, but there are times when I have needed to re-locate (the rain started) and it was difficult, if not impossible to move my burning stove. You use more fuel than you think you will. I found that lighting my alcohol stove requires priming and the right amount of priming is dependent on a number of variables such as air temperature, humidity, and altitude. I don't want to have to think about all those factors. I just want to heat my water, right now. There is no 'now' when it comes to heat when lighting an alcohol stove. You have to wait. My experience has been that heating water with my alcohol stove takes twice as long as what it takes to heat it with my canister stove. So I have to wait, and some times I am waiting longer than I should because I don't want to lose any more hair on my hand trying to deal with Problem #1. Finally, in my opinion, the weight difference between the two systems is quite insignificant. Here is my reasoning and research. This is my actual experience and is not necessarily super-scientific, however it is compelling enough for me and my decision. 3 teaspoons of alcohol will boil one cup of water. 0.1 ounce of Propane/Iso-butane (isopro) will boil one cup of water. I got these numbers using my own equipment. That includes an antigavitygear.com pot cozy and a home-made windscreen. I only boil water, I don't cook food or simmer and saute'. I eat only because it is a necessity to continue to live. If I want gourmet food, I go out to a nice dinner when I get home. Also hot food, for me, is a necessity. I think eating only cold food on my trip would reduce the enjoyment of the trip. Comparing alcohol to isopro, roughly speaking, I get 4 times the amount of hot water for the same fuel weight. That doesn't account for container or stove weight. In order to do that we need to consider an actual trip. Let's consider my JMT trip this coming summer. I am planning to hike the whole trail in 12 days. My planning indicates that I will need 13 breakfasts and 12 lunches and 13 dinners. I only heat water for breakfast and dinner. Each meal requires 2 cups of hot water. I am going to need 2 * (13+13) = 52 cups of hot water. This means I will need either 0.1*52 = 5.2 ounces of isopro or 0.4 * 52 = 20.8 ounces of alcohol. My alcohol stove weighs 0.3 ounces and a 1 liter platypus bladder for the fuel weighs 0.9 ounces for a system weight of 1.2 ounces. Add the fuel and the system for a total of 22.2 ounces. A 110 gram of canister (Snow Peak brand) isopro weigh 3.1 ounce empty and contains 3.88 ounces of fuel when full. My Optimus Crux stove weighs 3.5 ounces and two empty 110gram canisters weighs 3.1 ounces each for a total weight of 9.7 ounces. Add the fuel and the system for a total of 17.5 ounces. (this gives me an extra 2.56 ounces of fuel). On the face of it, the isopro solution is lighter even with the extra fuel. I understand that using resupply or a different combination of canister and stove will result in a different set of numbers. What I was quite surprised about was the fact that the canister option starts off lighter than the alcohol option. Intuitively I thought that a stove and canister difference would have ended up with the alcohol option being lighter. The difference is in the amount of energy contained in alcohol versus the amount in isopro. I am not the first to discover this and you can see here at BackpackingLight.com, here at the Appalachian Mountain Club and here at Paul Magnanti's blog that many others have researched and documented the same thing. My reasons for going with a canister stove have more to do with the problems I have described rather than the weight of the comparative systems. There is something magical about sitting down in front of my cansiter stove and hearing it's comforting whoosh as it heats the water for my dinner after a long cold windy hike in the rain. 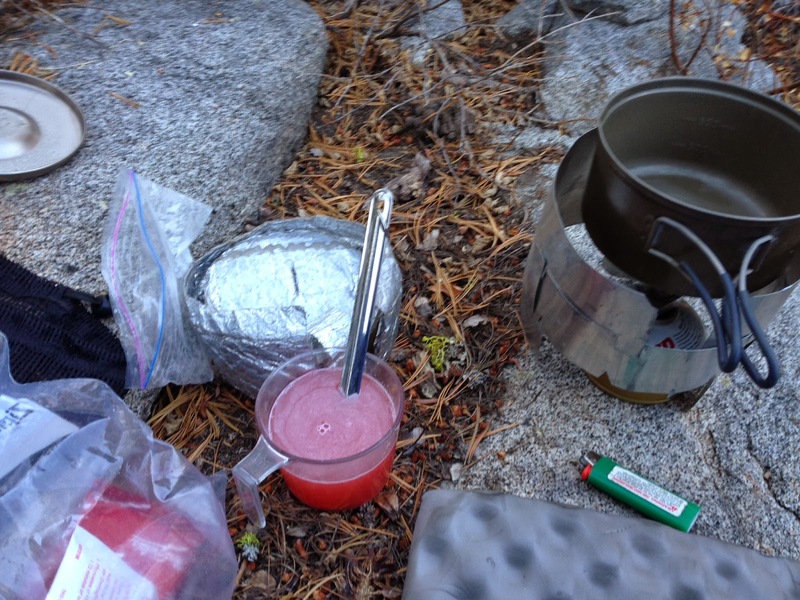 I bring my canister stove on my trips whether it is an overnighter or an extended trip. It is reliable, relatively safe, and if she knew I was using it would probably make Beth Boyst happy too. I see simple alcohol stoves as improved Esbit tablets. If you are OK with the slow pace they impose, then it can be a nice Summer option in the Sierras. When I was in a big hurry to make miles on the JMT a few years ago, a Snow Peak Gigapower butane stove was a better choice.